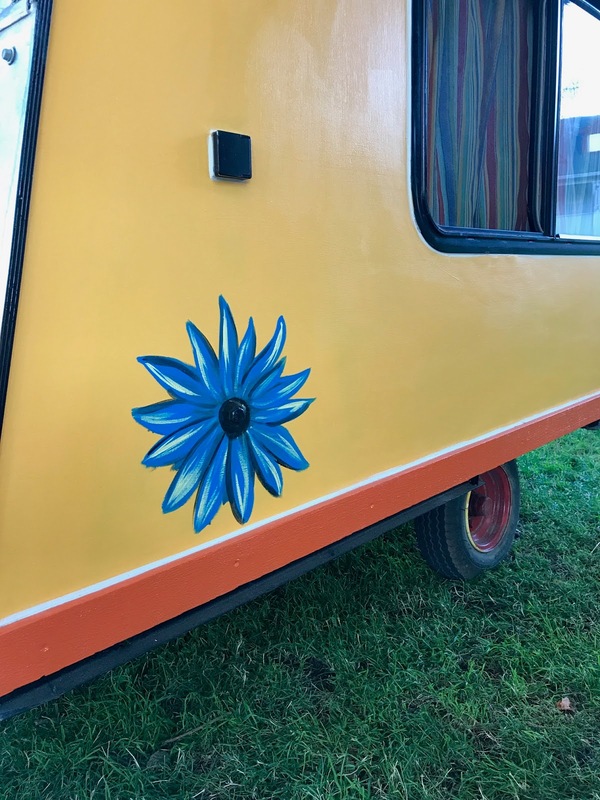 While sitting on a closed freeway one day, pondering “what to do next” with my life, I looked over at the car parked next to me and noticed that they were towing a teardrop. 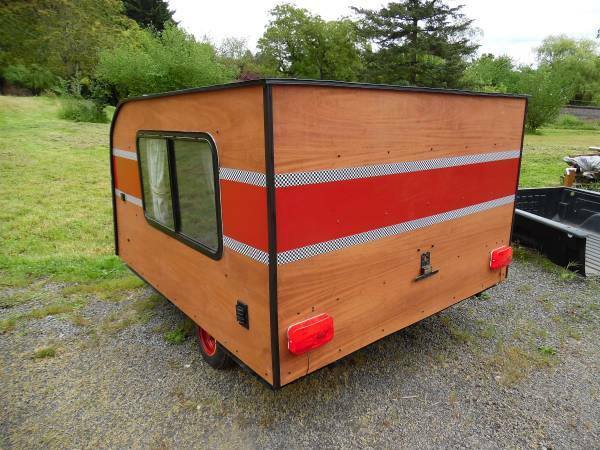 I’d always wanted a teardrop trailer but had NO idea how much they would cost. 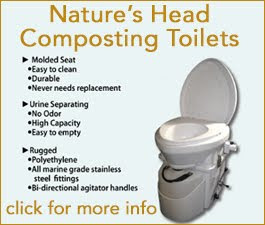 So, right then and there I went on Craigslist and found a homemade one for sale. The next day, on a somewhat-irresponsible-whim, I bought it for $1,000 (which I borrowed from my 18 year old son) from an old guy who made it in his garage, atop a pop-up camper trailer frame. Early in that same week Mark and I had been discussing possible plans to travel the country and we had calculated that a small car or truck, and a teardrop, would be the LEAST expensive way to do so whilst still maintaining some sense of comfort. (A comfortable, dry, secure, warm, bed every night) My newest acquisition wasn’t pretty, by any means, but it was cute and sturdy and lightweight enough to pull behind my convertible. A few months later, I loaded our two kayaks onto the top and we took it camping for the first time. And, in the end, Mark was less than impressed. Granted, he had (ironically) arrived at the camp site after 5 hours of being stuck in traffic because of an incident that had closed the freeway. He arrived, grumpy, tired, and his mood or his attitude towards my little teardrop never fully recovered. He has a good point, of course. Since there is only one door the person sleeping opposite the door (him) has to climb over the other person (me) to go to the restroom in the middle of the night. And, truly, honestly, it really is too small for two. But the upshot is that after that weekend I parked the teardrop in the garage and considered “what to do next”. I moved that winter and the teardrop moved from the garage to the front driveway. Then it moved from the driveway to a storage lot. And, in retrospect, I trusted the maker far more than I should have. During that frantic time, I wasn’t as diligent as I should have been about keeping it fully covered, and after the move dust settled I discovered that quite a bit of water had gotten in. I doubled my efforts at keeping it not only covered but fully wrapped in a tarp, and put desiccant in to help dry it out. In the Spring, after a MUCH more discriminating inspection, I discovered that the maker had expended NO effort in caulking any of the windows, or the door, and had actually installed one of the windows upside down. The winter rain pooled in the sill, and then leaked over and down into the walls and interior. Also, the stain he had used on the exterior contained NO sealant properties so the plywood itself had also absorbed a fair amount of moisture, was swollen, buckled, and pulling away from the frame. First, I caulked and replaced every fastener holding down the metal roof. I then dropped it off with a woodworking friend of mine to replace the dysfunctional-boat-hatch-used-as-a-door, bought some new fabric for the curtains, and inspired a seamstress to take on my project amidst her many others. Finally, I removed the metals screws (Who uses metal screws on a wood trailer?) 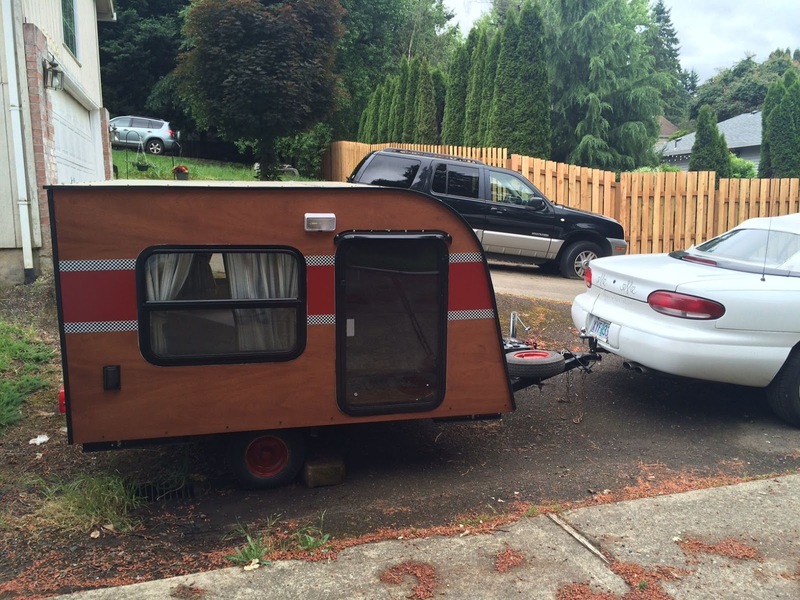 replaced them with wood screws, caulked the heads, sanded the trailer, and SEALED IT! 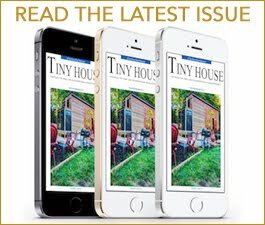 Then I moved on to work on my two tiny houses under construction. I cannot control everything. I know that. But I’d like to. And, in my younger days, I would emotionally “fight” delays and push harder to “make” things happen. But lately, I have decided that a far more laid back approach is needed in my life. 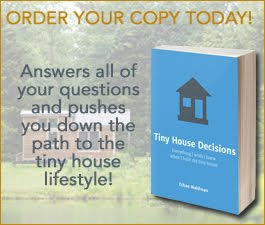 So, when my tiny house builds were both delayed, leaving me with more “down” time than I would prefer, instead of pushing and fretting, I turned my attention back to my little teardrop; to something I COULD control. After the new door was done, I picked it up from my good friend Bruce at Friesian Woodcrafters; and it was then that I noticed a few mold spots under the window. Masked and determined, I demolished the entire bed frame and wiped down the interior with soapy bleach and mold prevention spray. Once again I discovered how many shortcuts the maker had made. 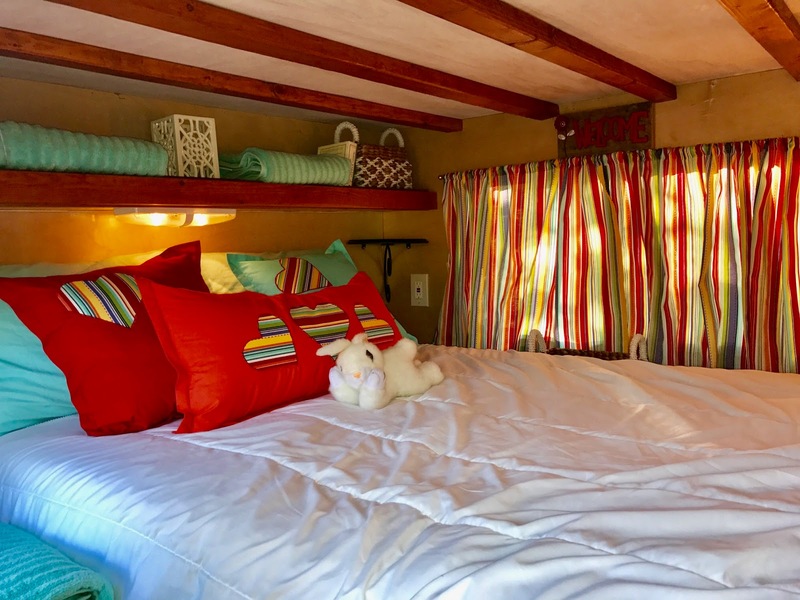 For the bed platform, instead of using ¾ ply, he used 3 sheets of ¼ ply, assembled in three layers, made up of different sizes and shapes (some not even attached) pieced together, and covered in carpet pad and headliner fabric. (What a mess. What was he thinking?) After demo, I then rebuilt the bed frame with slotted pine boards which would provide MUCH better airflow and access to the under bed storage, as well as give me the ability to visually monitor for any potential future moisture related issues. 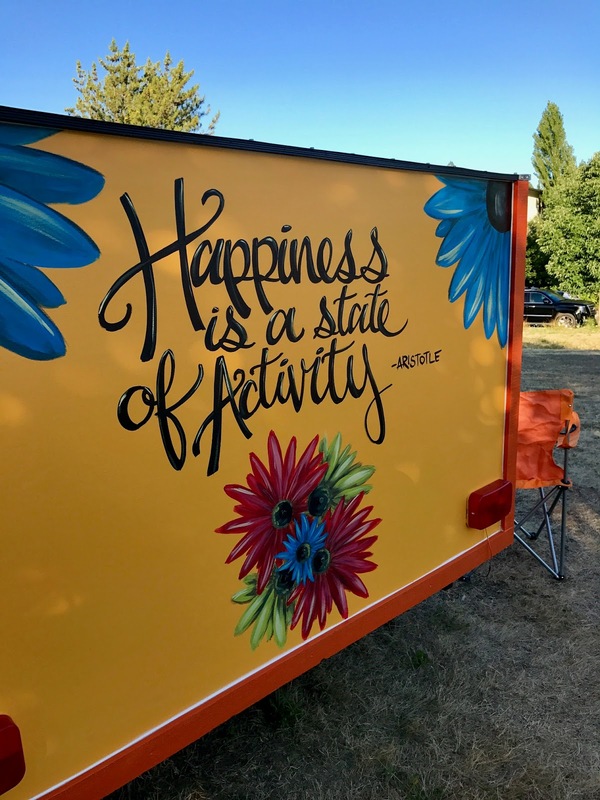 Inspired by the Sisters on the Fly, I knew I wanted to have the rear of the trailer painted by an artist. I had some paint left over from another project that I originally wanted to use but, after a LOT of unexpected drama that I won’t go into here, and five time consuming coats of new paint later; it was ready for the final stroke of artistic genius. So, in true Michelle-form, I placed an ARTIST WANTED ad on Craigslist. Within a few hours, several local artists submitted their work, and I hired one whose work mostly closely matches my style. That evening was so fun! Jacob was prompt, funny, and is uber talented. He flawlessly, affordably, and easily executed my flowered vision quite perfectly in one sit-down. Free form. Color me impressed! Inspired by Aristotle, her new official name is Aris the Hippie Teardrop. 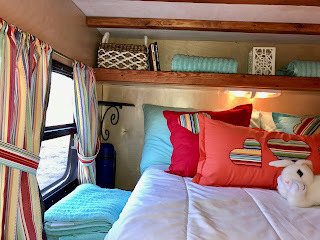 She weights just over a 1000 lbs, sleeps two (albeit cozy-like with an 8” thick memory foam, Full size, mold resistant, Parklane mattress) and is off-grid friendly with battery powered lights. 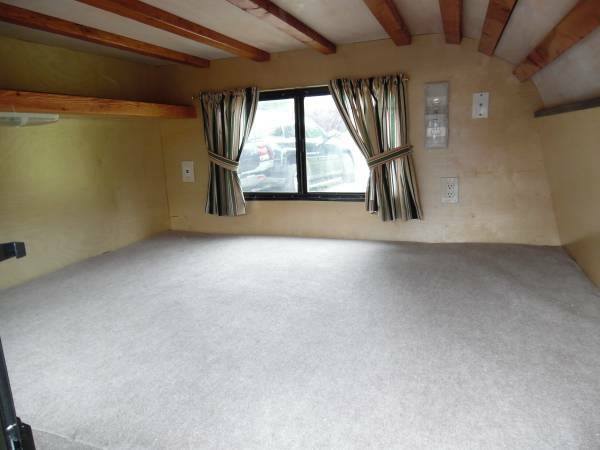 But, she also works well on-grid and plugs into campsites for full functionality. When plugged in she cools easily with the use of a fan and heats quickly with a tiny, round, freestanding, space heater. 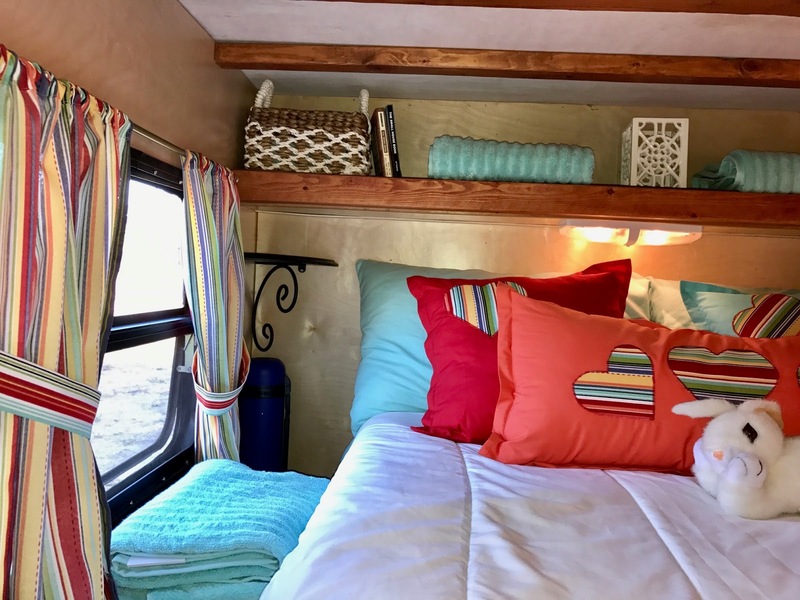 She boasts 56 sq feet of under-bed storage and can easily haul enough camping gear to accommodate her occupant’s enjoyment of both the convenience of teardrop camping and the primitive nature of tent camping. I have one vice: Creative Projects. They feed my soul, keep me up at night, energize me, and fill my ongoing and quasi-insatiable need for self-validation. Yes. I can do this. I can do anything I set my mind to. It may not be perfect, (nor am I) and everyone may not like it, (or me) and that’s totally OK. I know that wherever Aris goes, smiles will abound, and I hope her message will inspire others to not just dream but to “DO” what makes them the most happy. Awesome job, and thank you! My mom asked me this morning what I would do if I didn't have to work everyday...I thought all morning, "I'd make others HAPPY." 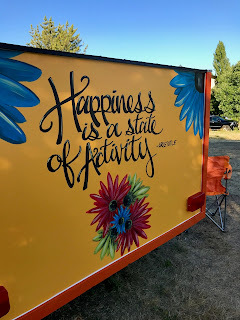 Happiness is a state of Activity...what am I going to do about it?? Something soon! I'm always happy when I'm doing something creative! Great job and great philosophy, Michelle...! I know it made me smile! it's amazing idea. thanks for sharing.